Yet Another Goal Setting New Year’s Post? January 16, 2012 By Paula 47 Comments This post may contain affiliate links. Does time seem to speed up as you get older? It certainly feels that way to me. 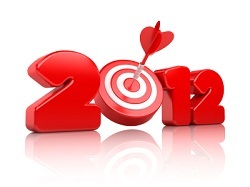 Last year just flew by and here we are already in 2012 and of course that means the obligatory goal setting post. Yeah, I know…ho hum…it’s not the most interesting of topics and most people try to ignore it all but it doesn’t have to be an ordeal and if you really want your business to flourish then you simply have to set goals. But don’t worry, we’re not going to go into a lot of detail on how to set goals in this post. You only need to do a search on the net to see how to do it. Let’s just say that we recommend that you set goals for your business for 2012 and leave it at that. Oh, and just one more thing, when you set your goals aim high. I know most people set a goal to make $100 a day when they first start out but instead set if for $300 a day or even higher. As Ralph Waldo Emerson says: “We aim above the mark to hit the mark.” In other words, if you want to reach your goal you have to aim higher. So you’re probably wondering now just what this post is going to be about since we aren’t really going to talk about goal setting. I’ve kind of been wondering that too as I write this but it came to me that goal setting on it’s own isn’t enough. For goals to truly work you have to take action. I think we all know this and we all take some sort of action but is it the right type of action? To see whether you are taking the right action you need to look to the past. This is a great time of the year to do that. It’s a time to reflect and see whether all the work you put in last year made any real difference to your business. For us, 2011 was a year of trying new things and looking for ways to diversify. It some ways, we didn’t really move forward in any big way despite the work and effort we put in. We mentioned in a previous post that we kind of got back into our old habits and didn’t focus as well as we could have…working on too many things at the one time really doesn’t work. We keep telling people that but sometimes we need to be reminded ourselves. However, despite all of that, and despite the depressed economy in the US, we still did extremely well last year so we are happy. What about you? How did your year go? If you look back over it, at least in terms of your online business, what did you accomplish? Did your business improve in some way over the year? Did you actually do anything to move forward in your online business or was it a mishmash of scattered projects, implementing new methods, tweaking websites and wasted time spent on forums, Twitter and Facebook? If you had spent the year only backlinking and adding quality product reviews and content would you be in a better position today? More than likely. If you’ve been around a while and still not making money then you really have to decide whether this year is going to be the one for you. You can’t keep doing the same things because you are only creating a cycle that will continue and by next Christmas you will still be struggling to make it. There are a lot of people who follow this blog and we know that many of them aren’t making the big dollars yet and we know they are capable of doing it. What we want to see is those people finally making a success of it this year. You can do it – if we can do it so can you. There is nothing special about what we did apart from the fact we focused and we focused big time. Most people think that the reason we make the big dollars is that we chose the right niche. Nothing could be further from the truth. It was never about the niches because you can make money in just about any niche. What made us the big dollars was that we focused on just a few things at the one time. We stopped reading forums and blogs, we stopped working on all of our 20 or so websites, we stopped checking stats on a daily basis, we stopped spending time on Twitter and Facebook and we stopped buying ebook after ebook looking for new methods for making money. Here’s just an example of one of our many plans that we went through over the years. This is a weekly plan for when we decided to focus on just one site. Are you kidding? Yes, it was a bit ridiculous and I wouldn’t recommend that to anyone. That plan didn’t last too long as it was a bit extreme but it just shows you where our focus was at the time. When you have a plan like that you don’t have time to even think about Facebook, forums, stats and other things. Now remember that there are two people working on it so that is just ONE product review per person so they are focusing big time. And just to emphasize here that they aren’t working on one website each…it’s just one product review each. In fact, they are obviously so focused on focusing that (although they probably didn’t realize it) in their last email to us they used the word ‘focus’ four times! If these two don’t succeed it won’t be through any fault of their own. We go on and on about focusing but it needs to be repeated because it’s where most people fail. And for us it’s the same, when we don’t focus we don’t see any improvement. So our advice is to look back to last year and see what you achieved and whether the action you took really made any difference at the end of the day. If not, then your next decision is easy – either continue doing the same things and never really get anywhere or make big changes and finally succeed. Nice post! 2011 was a good year for me but a couple of personal problems distracted me late in the year. Excellent Ben…just maintain the momentum and 2012 will be a great year. I also am thinking that partnering is a very smart thing to do. My mom and I decided to partner up in December, mainly because I was showing her the ropes and I realized she’s a much better writer than I am, and so instead of teaching her everything I just showed her how to do good reviews and the two she wrote for what is now our site (I’d already had one with 4 reviews on it) are now the highest ranking reviews, and the bounce rate is a lot lower, too. I’ve discovered that what has happened is that she is able to focus on what she does best, and I am able to focus on what I do best, and together we are getting way more results than we ever could have done separately. We’ve even split up the year and scheduled time in, 2 weeks at a time, to focus on one review at a time and then move on to the next. Every weekly task is scheduled, and we’re even writing extra guest posts without having a gig just to have some on hand. If by next quarter we’re ranked highly enough on the reviews we DO have, then we’ll do a few more. Partnering up with someone is definitely a great way to go…assuming of course that you choose the right partner. It’s not always easy to find someone that is in synch with you so you are lucky to have your mom. She is obviously doing something right with those reviews so that’s excellent. It’s been a while since your last post. First of all, i’d like to greet you Merry Christmas and a Happy New Year. I know it’s already too late for this kind of greeting but i’m one of your loyal followers and i just didn’t have the chance to greet you last holiday season. Anyways, i think most people always have this new year’s resolution. It’s already a tradition but people don’t realize that they don’t need one as long as they’re doing good on their business. That’s the part that people should understand that they don’t need to change anything in terms of business if they’re doing good since it may only put their business in danger. Yes it has been a while since our last post. We had a bit of a break after Christmas and both went interstate to visit family and to just chill out. It was nice as we needed a bit of a breather from the business. And thank you for your holiday wishes. Hope you had a good Christmas and New Year too. I like to have plans that are well organized. From person1-3, it’s a bit odd to have these in a year. It’s too boring (glad you won’t recommend that) but as long as online marketing would do, it’s essential to do these things. I agree – it’s always good to have plans that are well organized. We usually get the butchers paper out and write up our plans for the next few months and stick them up on the wall somewhere. It keeps us focused. Great post ladies! I found your blog over a year ago, but your advice has just started to really sink in for me in the last couple of months. Focus is really the key – I can see that in my stats. My earnings hit a record high last month and the credit goes to you Paula and Wanda. Thanks a bunch! By the way, I noticed I get quite a bit of traffic from Canada. Do you know if Canadians can make purchases at Amazon.com or do we need to link to Amazon.ca to earn commissions? It’s so good to see that you had a record month Dave – we love hearing that. In terms of your Canadian traffic I am pretty sure that they can make purchases from Amazon US however they may be limited in what they can purchase. As an Australia we can purchase from Amazon US but there are a lot of products that they just won’t send here so the same may apply to Canadians. You can use geo-targeting plugins that can get around this. Just search for that in Google using the following keywords – ‘geotargetting Amazon plugin’. Seriously, I think i should pay more attention to the Social Networks because i was very lazy to do so in the last year. Also, I have to make some kind of better organization of my time, but that’s not critical yet. I think the social networks are becoming more and more important. I know that Google is paying more attention to them but not too sure how they are incorporating them into their search results. Happy New Year Ladies! We probably all get distracted at times taking away our focus from what we really need to be doing. I know that I have. Finally I have learned (I hope) that no matter how great a new get rich product appears I never seem to get the time to go through the extra courses and end up wasting time and money. When it comes down to it I know what works and that is, as you have already mentioned staying focused on one thing and doing it well. Don’t dilute your focus and energy trying to make a dozen things work – do one first. I had to laugh when you said that you never seem to get the time to go through the extra courses because we have the same problem. We purchased a video course a couple of months ago but still haven’t gone through it all. Fortunately we very rarely buy a course these days but next time we do I am going to ensure that we have some time set outside to go through the whole thing BEFORE we buy the course. A great and instructive post as usual. Is there any occupation with as many distractions as internet marketing? If you can truly focus on doing so many backlinks, articles, reviews, etc. each week you can succeed but it is the ultimate test for most of us. Staying focused! Thanks so much and have a great 2012. You said it perfectly Jerry – this business is full of distractions…no other business works quite like this one. It is a struggle to stay focused. Yet another timely reminder. This year I have several thinks I want to achieve, however, first and foremost I want to focus. I have great ideas – even if I say so myself, yet I never stick with the plan long enough. If I don’t see any results (i.e. $$) in a couple of months I leave a site and move on to another site and another method. This year I have going back to a site I registered in the summer and I am going to focus on it alone for three months, nothing else but this site every day. I plan on putting three product reviews on it and then do as many forum comments and articles as I can. I have to admit that backlinking isn’t something that I do……. LOL, you’re like me Ruth…you are an ideas person. I have new ideas pop up every day so it can be difficult not wanting to put them all into action. I love your plan. It was only when we focused on one site that we finally succeeded. I’m just getting started in the online business arena. I’m going from no action to plenty of action. Don’t have much to learn from last year so I’ll be depending on blogs like yours for insight and inspiration. Looking forward to further reading around here! Welcome to the business John. It’s a great business to be in. Hope you can find some useful information here to set you on the right track. I think the issue is that it’s kind of fun reading blogs like yours and leaving comments, whereas looking for guest post opportunities is work! I have signed up to myblogguest, but have found their platform confusing. Am going to have to watch their video again to see how it works. I agree with you Rose, at first I found it a bit confusing but eventually I managed to work out what I needed to know. Watching the videos is a good idea. Once we added a couple of our blogs we found that authors approached us with articles. You are under no obligation to take an article that is offered if it is not up to the standard you are looking for. When I go into my account I simply go straight to the inbox to check for offers or news updates and if I am in need of an article I will go to the Article gallery and make an offer on anything I think might suit one of our sites. We have over 20, which is ridiculous, and it is nigh impossible to keep adding fresh content ourselves. This is a wonderful post. I have worked on many sites in the past and found myself just spinning wheels. I am finally starting to see results, albeit small results but I have found that I enjoy the journey so much more. I decided to focus on my passion for gardening and I am so much happier. Thanks again for some really great advice. You know Patti we have found the same thing, when we focus on the things we are passionate about everything seems to fall into place, the reviews are easier to write, the workload just flows and in return the monetary rewards increase. And we decided quite some time ago that we want to enjoy what we do, we don’t grind away all day at something we are not really interested in just to make money. Gardening is such a wonderful passion to have and people are always looking for good advice and products to help with their gardening efforts. Focus is the key……..I spend each and every single day working on 1 single website. That can include adding content or backlinking. I work on one site. I don’t have any desire to build another website. I’m having fun with the 1. Just the thought of me having 30 websites(like I did 2 years ago)just makes me cringe. As always, it’s great to read your blog. Excellent Ron! Not many people can work on just one site. Doesn’t it feel so much more relaxing working on one site? The pressure isn’t there anymore because you don’t have to worry about the other 29 sites sitting in the background waiting to be worked on. Thanks for the post and I stumbled upon here at right time just @starting month of 2012. I have not set any primary goal but have some small goals but not really targeted.This one is like an eye opener for me and I’m setting up some goals for every month and one final one to accomplish before the end of the year. That’s a really good way of setting goals by doing it on a monthly basis. I like that. I wonder if building one website with many topic is good? For example, at first, it will focus on “topic 1”. Write quality reviews, write info articles that link to it and guest blogging until the reviews ranked in the top position in Google. Then leave the “topic 1” and going ahead to the “topic 2” on the same domain. I wonder it would affect the rank of the first topic? It would be a daunting task to have many mini website that focus on single niche…. especially in maintenance. We have websites that cover a variety of different topics and they work. I’m reading your guide and you are advocating people to build a handful of pages instead of making a lot of websites. I wonder if you’ve ever hit a mark where you’ve sold 7-10 items/products from your 1 page of review, daily? I’m starting up such kind of project, so it would be wonderful if I can get your comment on this matter. I’m trying to create 1 page where I can sell about 7 to 10 of the promoted product on daily basis. would be possible or impossible to do it in a year or two? Your weekly plan looked real ambitious! I’m soo guilty of that also. I revise my weekly plan like weekly lol! I never set out to do what I would really like to do. I stock pile all those tasks and maybe get about 1/4 done. Hiring outsources now helps but you always feel the need to do more to keep things really going. You’re not alone there Samuel. We are still too ambitious with our plans and we revise them too often as well. But we can only do our best. I think it’s because even to this day we try to do too much – it’s hard to avoid with this business. Hope you have an excellent 2012! “Spreading yourself too thin” in my opinion is the number one reason why most people fail on the internet. We’ve experienced it first hand and know it doesn’t work. Even now we still do too much so we keep having to stop ourselves from starting yet another project. We have plenty of ideas but not enough time to implement them all. I have three websites I am working on right now. Mostly working on backlinks right now. Have moved one site from page 31 on Google SERPs to page 1 for the keyword phrase. I’m then going through the second site and gaining many backlinks and hope those SERPs will be better. On page 7 now and page 32 for another keyword. I hope to get to page one for both of those within a few weeks. Will do the same for the third site and then go back and work on other keywords for each site. It’s very time consuming and I better remember to post articles too. That’s where I’m lacking right now. Your post was inspirational to me and I better stop commenting right now and start working on my sites. When the family is asleep is when I get most of my work done and it’s almost bed time for them. You could try myblogguest.com for articles. You can sign up for free and get unique well written articles for your blog. We have been using them for a few months now and have posted some great articles to some of our blogs. Thanks for the website suggestion. I checked them out. Is there any catch? Is this just an article directory or is it more of a place that guest bloggers hang out and see what I need? I saw a section where people pay for freelance work. Have you had to pay for any articles? You don’t have to pay for any articles. People add their articles and if you are interested in posting one to your site then you place an offer. If they like your site they will accept your offer and you can place the article on your site. You have to include their links of course – usually it is a link in the author byline and/or a link in the article. As usually.. this really is my favourite blog to read in terms of affiliate marketing! You guys rock.. However, can I ask you… what does your weekly plan look like? How many guest posts do you publish? How many new articles do you write for webmasters etc etc.. I would love to know what your daily/weekly plan is??? Also… even thought you seem to be backlinking organically.. do you ever get hit by google moving you down a few spaces? We will be writing a blog post about our weekly plan quite soon so stay tuned for that. As for Google, so far we haven’t been hit by any sort of Google update. Many years ago when we were first starting out one of our sites was penalized. To this day, we have no idea why but you never know what Google is up to. We just moved on to another site. I have heard that Amazon just changed their TOS few days ago and they won’t pay commission based on the 24 hours cookie if the user comes back directly from Google or types Amazon.com so basically we won’t get money from the returning customers..is that right? From that I can’t really see anywhere that says that they won’t pay a commission within the 24 hours if they have logged out to go somewhere else first. Either way, we haven’t noticed any decrease in our sales. Very well said! I agree with you, the barometer of our goal this year should be our achievements last 2011. This way, we can check what are the things we need to improve on this year. Exactly, but it’s not good to dwell on it for too long either. We don’t want to be constantly in regret mode for what we didn’t do or what we should have done. Better to move on and do it right this year.